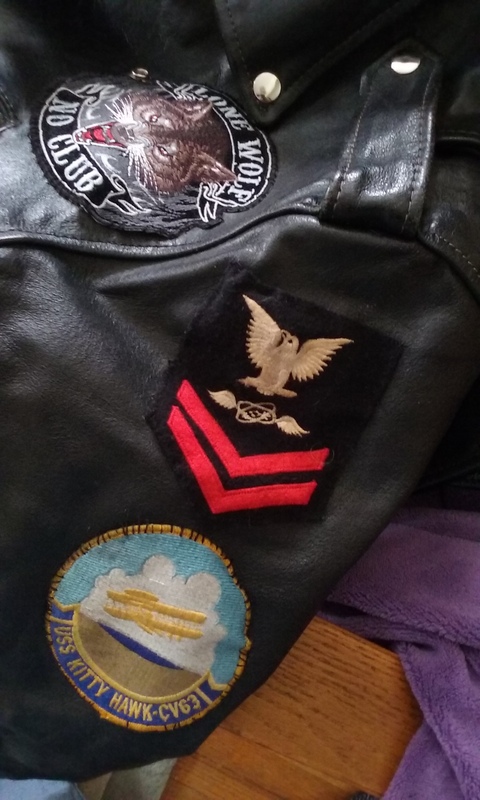 Adding Ralph’s Navy crow to his motorcycle jacket. We finally received “plowable” snow in Minneapolis. It’s been a strange December, with temperatures lingering in the 30s and bouncing up to the 40s. When I did a book signing at the Harley-Davidson Shop of Winona on the 9th, folks were talking about mowing their lawns one more time. And there were more than just a couple of bikers who showed up for the open house on their motorcycles. It was that nice outside. Now the snow has come and the winter ritual of piling up snowbanks has begun. The streets are driveable for cars and trucks, but too tricky for bikes. Most of them have been cleaned and polished and their batteries are stored for the winter. Time for indoor activities. Like re-arranging the patches on my husband’s motorcycle jacket. He likes to collect patches from places we’ve visited and rides he’s participated in. Last spring he went on the Patriot Ride and noticed a number of veterans who had their military rank sewn onto their jackets. He wanted to add his. Normally, I take his jacket down to a little Greek tailor in our neighborhood and he sews the patches on for $5 each. Trouble of it is, he’s frequently overbooked, and I knew he wouldn’t understand how important it is to get that Navy crow on the left shoulder. So, I dug up a curved upholstery needle and went to work. Pushing a needle through leather is hard on arthritic hands! But now, the left arm proudly carries patches with Ralph’s rank and his ship, the USS Kitty Hawk (CV63), which, sadly, has been de-commissioned. The right arm will carry a US Navy logo and a patch for the Tonkin Gulf Yacht Club. When that job is complete, I’ll re-arrange the patches on the back of the jacket in a more pleasing configuration (after all, I have to look at them when we ride two-up!). If you’re looking for something motorcycle-related to do this winter, get a copy of Ride Minnesota or Ride Lake Superior and settle in for a cozy read on the couch. That should keep you busy until the motorcycle shows start in February.